The 500 Sport Bridge presented by Crates Marine Sales of Keswick, Ontario, named number one in sales and service worldwide for Marquis Yachts, was one of the largest boats on display at the 2011 Toronto International Boat Show and is the most recent creation from the yacht design studio of Nuvolari-Lenard of Venice, Italy. 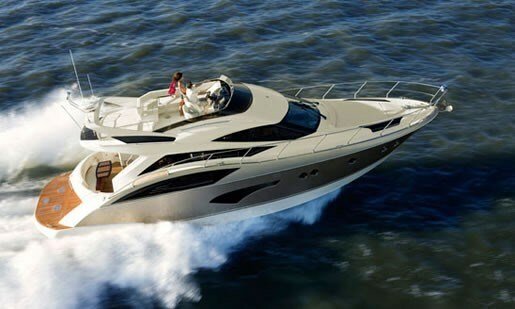 It is the second smallest of eight models of Marquis yachts for 2011 ranging from almost forty-four to seventy-two feet. Only highlights of this sumptuously gorgeous and exquisitely finely finished yacht can even be glossed over in a short presentation such as this, but suffice it to say, the levels and extent of detailing and equipment and amenities on board will impress and satisfy the most discerning and knowledgeable of the yachting elite. From the hand buffed cherry wood or optional high gloss Marquis™ jewel finish cabinetry and trim throughout to the designer decor with premium wall coverings and fabrics with matching accessories and pleated curtain window treatment to the fitted, embroidered sheet sets and pillow cases to the direct and indirect electronic dimmer-controlled lighting, all is in place to coddle and soothe. 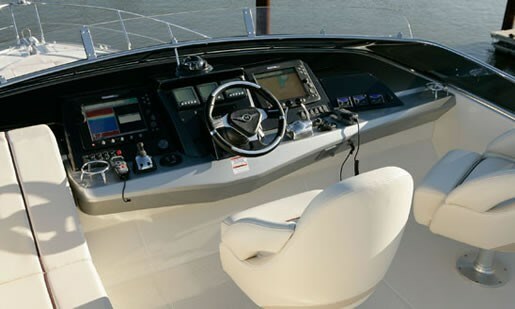 From the moment you step aboard the integrated swim platform and move through the transom gate to the cockpit, then through the bulkhead doors into the salon and forward to the lower helm and galley, you will immediately be aware of not only the expansiveness of the 500 Sport Bridge, but the fact that it is all one level for ease and comfort of movement, of entertaining, and of living aboard. And if 36 square feet of swim platform is insufficient, add the extended hydraulic platform for easier water access and for tender storage, launching, and retrieval. When the engines are not running, you can of course enlarge the cockpit and its seating capabilities by simply pushing a button to extend the transom lounge two feet aft to add 8 square feet to the already huge seventy-one square foot area. 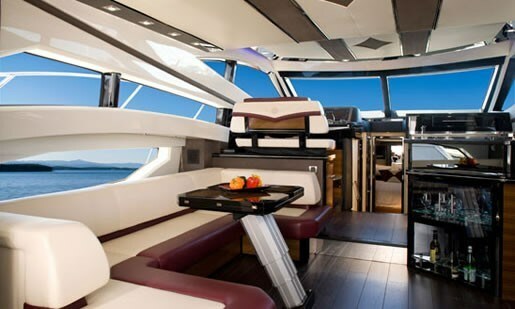 The 500 Sport Bridge will accommodate six overnight in three staterooms, two of these with queen beds, the third with two single berths, and all with the comfort of innersprung mattresses. An additional two persons could “rough it” overnight in the salon on the convertible double table/lounge. Both the master head and the guest head are similarly outfitted with marble flooring, indirect lighting, and each have separate shower stalls with seating and tempered glass doors. The bridge is immense, easily accessible and offers excellent visibility in all directions and to every corner of the 500 Sport Bridge. Two floorplans are offered; one with dual swivel, pedestal, adjustable helm seats with armrests and with a portside L-shaped lounge and aft sun pad, and the second layout with a single helm seat with a forward portside sun pad extending aft into an L-shaped lounge. Both layouts come with a fibreglass top table. “Standard Preference” power is triple Volvo Penta® 370 horsepower D6 (diesel) IPS 500 pod drives. You can optionally choose triple 435 hp D6 IPS 600 units. With either choice you get full dual LCD Digital Engine Display instrumentation with Volvo Electronic Engine Controls and IPS Joystick Control at both upper and lower helm stations. A Kohler 15.5 kW diesel generator is standard; 23 kW optional. You must choose the larger generator if you also choose the washer/dryer, the wet bar grill, spa shower, or trash compactor. The “Standard Preference” air conditioning is referred to as “Northern” at 38,000 BTU. You may also choose “Tropical” at 46,000 BTU, or “Desert” at 62,000 BTU! Other decisions you will want to make will involve a wide range of electronic and navigation choices from stereo and flatscreen options for the salon and all staterooms to a wide selection of Raymarine® accessories and even if you will need a SeaKey® satellite based boat security, safety, and concierge system. Of course many decor and designer choices will need to be decided upon including china, flatware, and how many of Marquis’ exclusive full lead crystal decanters with etched logos you’ll want. Decisions. Decisions. The choices are yours but the end result will be the same. You will be in possession of a masterpiece of yacht design, layout, and execution and you will stand out from the crowd wherever you go, wherever you dock, and wherever you anchor. Everyone will know that you have arrived.